Click here to watch the E-Z Lasher video. The E-Z-Lasher was developed by Pat Secrist for use in the Secrist Doll Factory because his people got tired of the tedious process of using tweezers and toothpicks to coax the eyelashes into the right place. It can make a real mess when one end of the eyelash - with the glue already on it! - pops out of the eyelid and gets glue all over the eye and you too. The E-Z-Lasher grips the eyelash and shapes it to fit the curve of the eye so that you can install the eyelash in one easy step. 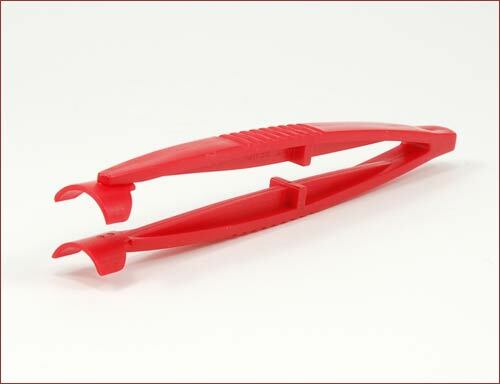 Once you get the knack for using this tool you will be putting eyelashes on in just one step. It only takes seconds with the E-Z-Lasher. Need eye-lash glue? 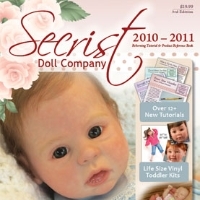 Click here for Secrist Super Glue. E-Z Lasher comes in black or red, color sent will vary.